RAF Typhoons launch for the first time with the Meteor Air-to-Air missile. RAF Typhoons launched from RAF Lossiemouth this morning for the first time with the Meteor Air-to-Air missile in defence of UK airspace during a Quick Reaction Alert (QRA) mission. This event represents the culmination of many years of research, development and testing to bring this advanced weapon into service on front-line aircraft. RAF Typhoons maintain a constant state of readiness to defend the sovereignty of British skies. The introduction of Meteor brings a new and innovative long-range capability and further enhances Typhoon’s already potent arsenal. This year they have been scrambled for a variety of incidents including intercepting Russian bombers approaching UK airspace. This latest missile system demonstrates the next chapter of the Typhoon which will see the jet evolve its ability to target and destroy any airborne threat at great distances. The Meteor missile will provide an unrelenting deterrence to those who wish harm upon the UK and our Armed Forces. The RAF’s prized Typhoon Force is unquestionably now the cornerstone of British and NATO military power. It has proved itself in combat roles over Libya, Iraq and Syria, protecting UK skies and overseas territories, and providing critical support to our NATO Allies in Eastern Europe. 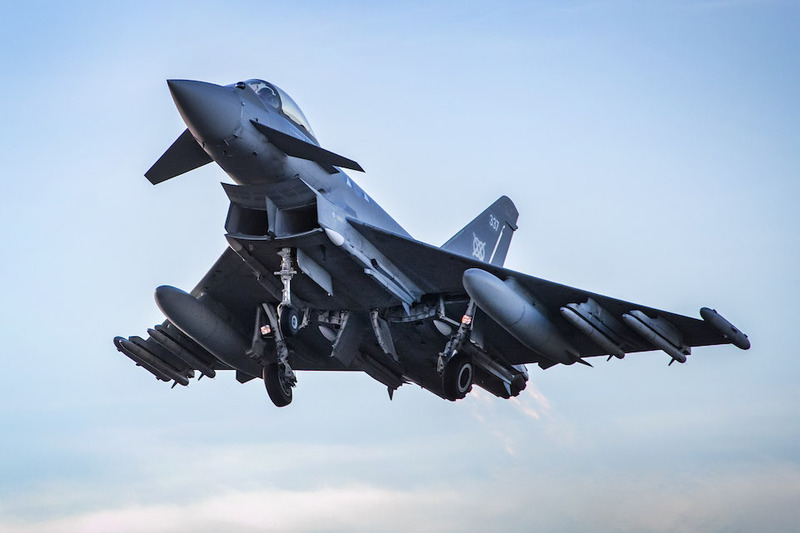 RAF Quick Reaction Alert Typhoon fighters are now armed with the most advanced Air to Air missile in the world, the MBDA developed ramjet powered Meteor. Another huge leap forward in capability for the Typhoon Force, which is proud to continue defending the UK and our allies, 24/7. RAF Typhoon equipped with Meteor missiles takes off from RAF Lossiemouth. The missile system is a worthy investment as it can fly in any weather condition, perform against all current and known future threats; including combat aircraft, unmanned aerial vehicles/missiles and will eventually operate from the F-35 Lightning aircraft. Crucially, the Meteor and launch aircraft will be networked by a datalink ensuring highly accurate and intelligent air strikes. The responsibility of flying such a capable platform, armed with this formidable weapon is immense, but the options this gives us in responding to an emergency situation cannot be understated. Meteor is a state of the art complex weapon developed by a six nation European partnership led by the UK. It is built and manufactured by MBDA in Stevenage and has created 430 jobs across the country. The RAF will continue to develop the missile through life, in-step with our International Defence and Industrial partners, supporting the UK Aerospace Industry, while maintaining the UK’s sovereign ‘capability edge’.